Mrs. Norma (Clyde) Haemer (now deceased) said that the first Bright school was named after prominent settler, Mr. Halbert A. Bright, and first opened for the spring term of 1894. At that time it had 13 students. Located on the southwest corner of Section 19 (on the corner of DD and N, four miles south of Owen), it was a picturesque, one-room, red, brick building with a white, wooden bell tower and an open porch facing west. After the population of the district increased, a second school, called North Bright, was built in 1924 on the northeast corner of the same section of Green Grove Township. I believe it was the fall of 1954 when North Bright School was closed, and the students from that part of the district joined us at South Bright, making our enrollment between 30 and 40 students. In 1958 South Bright School consolidated with Owen-Withee. The building was later torn down. I think the hand pump is still in the old school yard, and some of the trees remain. Frank Schroeder, father of Norma Haemer, built the red brick building (in the photograph) to replace the original school. Henry Awe's grandfather, also Henry Awe, settled in Green Grove Township in 1885.  The family came from southern Wisconsin by train to Colby, and then took an ox cart through the woods to land they had purchased in Section 31. (2005 will mark the 120th year the land has been in the family!) He recalled the first Bright school being a wooden building which burned in 1910. 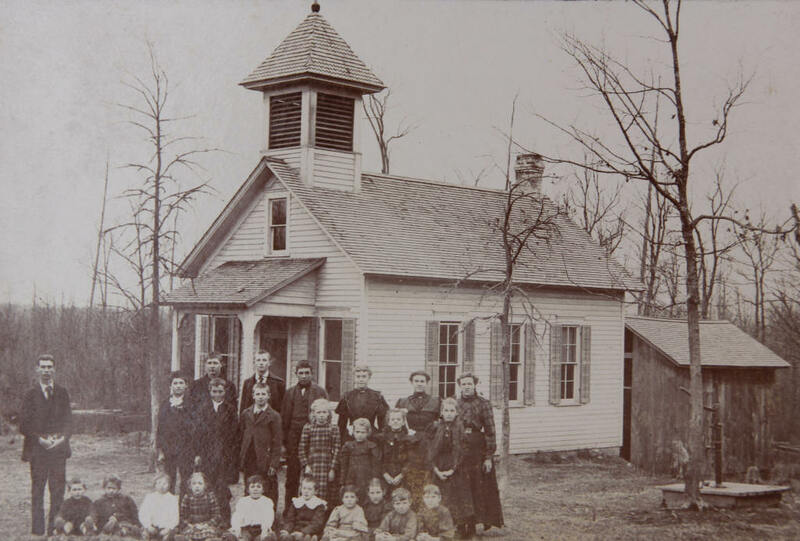 Above is a photo of students at the original Bright School of Green Grove Township, Clark Co., WI in about 1899, before that building burned and was replaced by a red brick building. *Fred Awe was father of Ilene (Awe) Pribbernow who owns the original photograph and was kind enough to share it with all of us! The school yard has been graded, which adds considerable to its appearance. Emma Awe (#1), Martha Awe (#3), Lydia Awe (#5), Arthur (actually Arthur Henry) Awe (#12), and William Awe (# 14). Those five children are siblings, the children of Heinrich Friedrich Johannes Awe and Charlotte Frederika Loos. As a small aside, Martha Awe was my paternal grandmother. If anyone can provide any info. on Edwin Awe (#13), Henry Awe (#15), or Fred Awe (#17), I would be delighted to hear from you. Best regards H.A. Kippenhan, Jr. Thanks for the interest in the photo. Fred Awe is the father of Ilene (Awe) Pribbernow who has the original photo. There is a photo of Fred's family and farm on the Town of Longwood pages of this web site. I believe Edwin and Henry are brothers of Fred, and all are cousins of Emma, Martha,Lydia, Arthur Henry,and William Awe. Edwin, Fred, and Henry are sons of John and Johanna Awe. Ilene Pribbernow tells me the names Henry, Fred, and John were used many times in the Awe family, making the discussion of the relationships a little complicated. 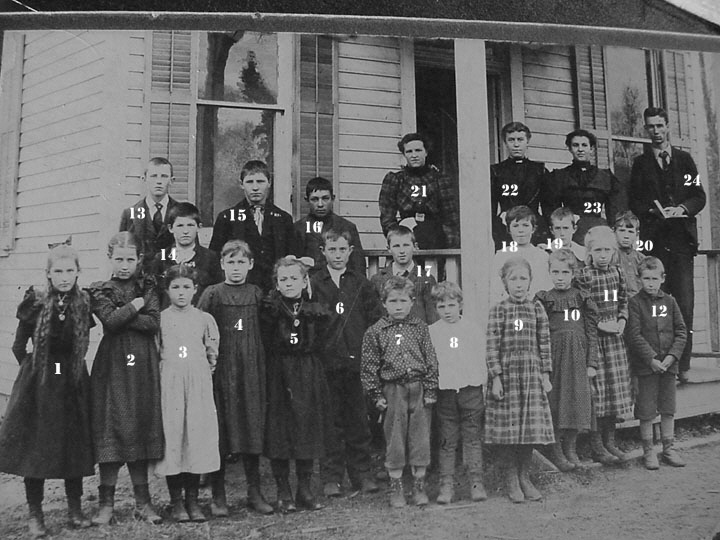 Second Photo of the "First Bright School, ca 1899" - scroll up to see the first photo. (Click on the photos below to enlarge them). *Please contact us if you can identify these students or their teacher. It looks like many of them are also in the photo at the top of this page (notice the girls in the plaid dresses and the teacher).